Welcome to the third and final part of this instalment of Brian’s Travel Spot, which chronicles my various flights to/from Chicago this year. 2017 has seen me flying over all the world, including three trips to Chicago in relatively quick succession. While all three flights to Chicago have started at Manchester, I’ve flown a different route each time and flown with different airlines. This Travel Spot is my attempt to compare and contrast my experiences. My first trip was at the end of June, when I flew with United from Manchester to Chicago via Newark, returning direct to London. My second trip, in September, took me from Manchester to London with British Airways and then on to Chicago with American Airlines. Once again, I returned on a direct flight, this time flying to London in business class with British Airways, just the second time I’ve flown long-haul in business, having done it earlier this year when returning from Vietnam. My final flight, at the end of October, was my most straight-forward, flying direct from Manchester to Chicago with American Airlines and returning overnight by the same route, arriving on Friday morning, just in time for the Manchester Coffee Festival. Welcome to the second part of this instalment of Brian’s Travel Spot, which chronicles my various flights to/from Chicago this year. My crazy travel schedule, which has seen me flying over all the world in 2017, has also resulted in my taking three trips to Chicago. The first was at the end of June, the second (September), I’ve just returned from, while the third one is at the end of October. Since I’m flying with a different airline each time and, despite always starting out at Manchester, I’m also flying three different routes, I thought that it would be interesting to compare and contrast my experiences. June saw me fly with United from Manchester to Chicago (via Newark), returning direct to London. Meanwhile, in October I flew direct to and from Manchester with American Airlines. 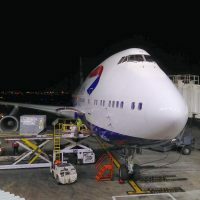 Today, however, is all about my recent trip in September, when I flew from Manchester to London with British Airways, then on to Chicago with American Airlines, before returning on a direct flight, this time with British Airways, to London. Even better, I flew back business class, just the second time I’ve flown long-haul in business, having done it earlier this year when returning from Vietnam. My schedule’s seen me flying to Chicago three times this year: at the end of June, the start of September and, for the final time, at the end of October. Due to various circumstances, I’ve flown a different airline each time and, although I’ve always started out at Manchester, I’ve also flown three different routes. I thought that it would be interesting to compare and contrast each of the three sets of flights over a series of three Travel Spots, if for no other reason than my own decision-making purposes: I’ll be flying this route at least once a year for the foreseeable future. June saw me flying with United out of Manchester far too early in the morning, changing planes at Newark, and arriving late afternoon in Chicago. In contrast, in September, I flew from Manchester to London with British Airways, and on to Chicago with American Airlines, catching the last flight of the day. 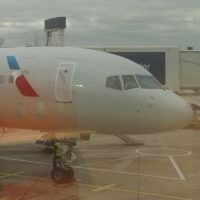 Finally, in October, I flew direct from Manchester to Chicago with American Airlines on the only direct flight of the day. Fortunately, all three return flights were direct: back to Heathrow in July (with United) and September (with British Airways), while in November I returned to Manchester on American Airlines. 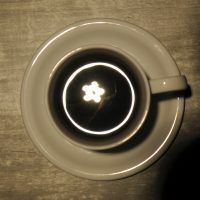 Wormhole Coffee is something of a Chicago institution, certainly in the Wicker Park neighbourhood which has been its home for six years, where it is joined by the likes of the (recently departed) Buzz Killer Espresso and relatively newcomer, La Colombe and Ipsento 606. Wormhole stands out because of its 1980s sci-fi décor, which includes plenty of Star Wars memorabilia (which I guess extends it back to the 1970s) as well as the pièce de résistance, a full-size “Back to the Future” DeLorean on a shelf at the back. 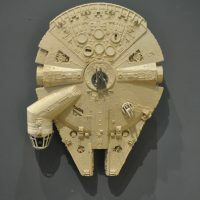 However, while some might be happy with this particular claim to fame, Wormhole does not rest on its laurels. 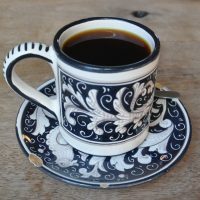 Not just an iconic location, it also serves damn good coffee, roasted in-house by its roasting arm, Halfwit Coffee, which has been around for five years. There’s a pretty good range too, with a house-blend, single-origin and decaf on espresso, joined by a selection of single-origin filters. This includes bulk-brew, Aeropress, V60, and Chemex, plus a guest roaster, also available through the V60. The single-origins on offer change every few days, while the guest roaster changes every month or so. There’s also a range of teas, plus cake if you are hungry. 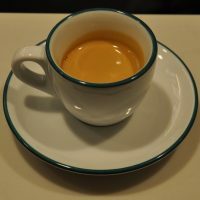 I feel a little bad about taking so long to write up Buzz Killer Espresso, since it was the first place I visited in Chicago when I was there last October as part of my around the world trip. However, given that I’m sort of back in Chicago (I’m actually in Madison all week), it seems the perfect opportunity to rectify this. Buzz Killer is just off Milwaukee Avenue to the northwest of Chicago’s centre, in the area known as Wicker Park, one of the longer-standing members of a cluster of great coffee shops which includes Ipsento 606, La Colombe and Wormhole Coffee. Buzz Killer roasts all its own coffee, with a house-blend on espresso, plus a blend and a three seasonal single-origins on V60. There’s also decaf, while the bulk-brewer, that staple of the American coffee shop, is mercifully absent. Buzz Killer occupies an interesting spot, offering a small, sheltered outside seating area and two contrasting floors. Downstairs (which is ironically up a flight of stairs from the street) is full of little tables, tucked away in corners, while upstairs is bright and open, filled with light and with a simple row of tables, plus a large, communal table. August 2017: Buzz Killer has left its long-time home on Damen Avenue and is moving, in September, to new premises further up Milwaukee Avenue in Logan Square. I managed to pay a visit when I was back in Chicago in August 2018. Although I didn’t visit the city on this trip, to celebrate my return to the Chicago area, I present Monday’s Coffee Spot, Café Integral. I first came across Café Integral in New York City this time last year when I visited its original location, inside the American Two Shot clothing store. Naturally, I was keen to try out the Chicago branch, which is in the lobby of the Freehand Hotel in Chicago’s River North. This came highly recommended by none other than champion flat white inhaler, Runaway Kiwi. She’d checked it out earlier in the year, declaring it her favourite place in Chicago. You can’t get a better endorsement than that! 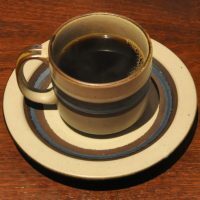 What makes Café Integral stand out from the crowd is its focus on Nicaraguan coffee. The Vega family, which owns Café Integral, has close ties with several farms in the country. There is a standalone coffee shop in New York as well as this one in Chicago, which makes it a national chain. Sort of. All the coffee is sourced in Nicaragua and roasted in Brooklyn. There’s usually one option on espresso, bulk-brew and pour-over, all backed up by a small, but interesting food menu and decent cake selection. May 2018: Café Integral now has coffee shops in three Freehand Hotels: Chicago (this one), Miami and Los Angeles, as well as a standalone coffee shop in New York. Sadly the orignal coffee bar in American Two Shot has closed. Tempo, along with Boston’s Charlie’s Sandwich Shoppe, is one of my favourite American diners, although compared to Charlie’s, it’s a very different place, slightly more upmarket in layout and feel, but still great value for money. All the usual diner staples are there, but you can also get full meals and everything is available 24-hours a day, seven days a week. Comfort food at its best! 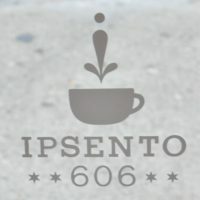 Ipsento 606 is the second branch of Chicago veteran, Ipsento, which has been serving great coffee for 10 years now from its home on Western Avenue. Ipsento 606, in contrast, opened this summer and while just a few blocks away on Milwaukee Avenue, it takes its name from The 606, the elevated walkway which is just a few steps away from its front door. Ipsento 606 is something of a rarity in American: coffee shop by day, cocktail bar by night. While this model has found a great deal of traction in the UK (think of Notes, Fernandez & Wells, Grind and Beany Green in London and the likes of Filter + Fox, The Attic and the Artigiano chain around the UK), I can only think of a few US examples (Philadelphia’s Double Knot springs to mind as an obvious example). I can only speak to the coffee shop part of the operation, but anywhere with not one, but two Slayer espresso machines, plus a single-group Modbar dedicated to single-origin espresso must be doing something right! There’s also the obligatory bulk-brew, plus a range of single-origins on pour-over, all roasted in a dedicated facility just up the road.